The good: Excellent screen size-to-price ratio compared to big-screen flat-panels; solid black-level performance; very accurate color, with minor tweaking; plenty of connectivity options. The bottom line: Samsung's HL61A750 61-inch rear-projection HDTV delivers excellent overall picture quality, and, compared to flat-panel options, it's a real bargain. Rear-projection HDTVs, as a category, are on their way out, and DLP-based sets are the only microdisplay choice available, now that all manufacturers of LCD- and LCoS-based rear-projection displays have basically ceased production. Samsung and Mitsubishi are pretty much the only players left in this category--they're the only two manufacturers listed on the Best Buy and Circuit City Web sites under "rear-projection." The way things are going, 2008 or 2009 may be the last year for rear-projection, lasers notwithstanding. As with any technology nearing the end of its lifespan, RPTV is becoming an even better bargain than before, as long as you're aware of its limitations, such as poor off-angle performance compared to plasmas. 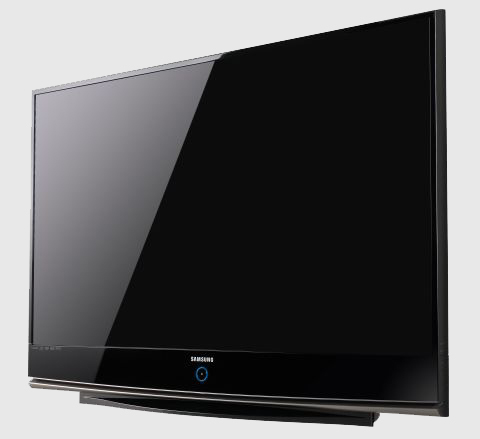 Samsung's HL61A750 is the company's top-of-the-line 61-inch model. It has a really solid feature package, with lots of options focused on optimizing the picture, and generous connectivity to accommodate all your video sources without any issues. Most importantly--at least to this reviewer--it is an excellent performer, with deep blacks and accurate color temperature after just a few tweaks in the user menu. Rear-pros may be a dying breed, but if you're looking to get 61 inches for less than $2,000 (street price), the Samsung HL61A750 is an excellent performer and handily beats the comparable Mitsubishi WD-65735. If you've seen one big-box microdisplay, you've just about seen them all. This is especially true now that Sony's interestingly styled SXRD rear-projection sets are no longer produced. 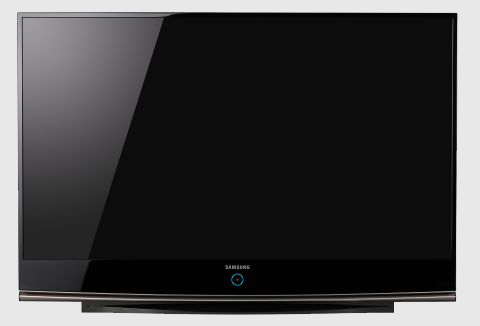 The Samsung HL61A750 sports a glossy black finish with a very thin bezel surrounding the left, right, and top edges of the screen. Samsung's signature round blue circle still sits directly below the middle of the screen. While the TV's cabinet is unchanged, the remote has undergone a complete makeover. It has a glossy black finish, and I wasn't a fan of the multicolored buttons. I was disappointed that it is not backlit at all, and the round dial around the Enter button intended to help you navigate the menu is awkward to use; I found myself going to places in the menu I didn't intend to visit. The internal menu system has not changed since last year's DLP models, and is quite intuitive and easy to use. Like most modern big-screen LCDs, the HL61A750 has a native resolution of 1080p, which works out to 1,920x1,080 pixels. While we often downplay the importance of 1080p resolution at smaller screen sizes, with a 61-inch screen you should be able to see the benefits of 1080p over 720p, albeit at a very close seating distance of 7 feet. You'll want to select Warm 2, as it's the most accurate color temperature. Three picture modes are available, including Dynamic, Standard, and Movie. I chose Movie, as it produced the best results at the factory presets. The selectable color temperatures are Cool 1, Cool 2, Normal, Warm 1, and Warm 2; we selected Warm 2, as its by far the closest to the broadcast standard color temperature. Dynamic may be the brightest, but Movie mode is the best for an accurate picture in a dark room environment. The Detailed Settings menu includes several additional adjustments and almost all of them, including Black Adjust, Dynamic Contrast, Edge Enhancement, and xvYCC Color, are best shut off. The LED control adjusts the backlight for the LEDs, and is very useful in optimizing the black level of the set. The lower you set it the better the blacks, but you also decrease light output, so there is a tradeoff. When in the Movie mode, you will find that many of the settings in the Picture Options menu are grayed out, indicating they are set correctly and should not be changed. I was very pleased to see that Samsung has added a Blue Only mode, which is helpful in getting color and tint set correctly, as a blue filter really isn't accurate enough with these types of displays (check this tip for details). Color Gamut comes set to sRGB, and that is the most accurate setting. 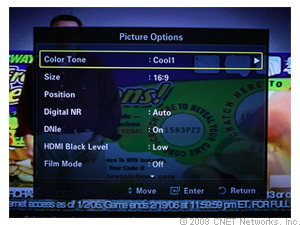 This feature changes the primary colors, and sRGB is very close to the HDTV specifications for red, green, and blue. The Normal and Wide modes bring the primaries way beyond where they are meant to be. 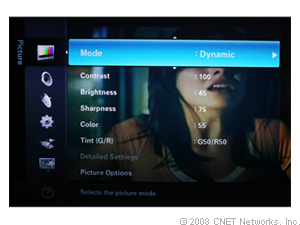 (Updated July, 31, 2008) The Samsung's selection of aspect ratio modes is solid, and includes a Just Scan option that displays 1080i and 1080p without scaling. Since this is a rear-projection set it still overscans about 2.5 percent, which obscures the extreme edges of the image--whereas flat-panel sets can typically show the entire image with zero overscan. With three HDMI inputs and two component video inputs, you should be covered for high-def video. There are ample AV connections located in the rear right side of the HL61A750. The most important connections are the three HDMI inputs. 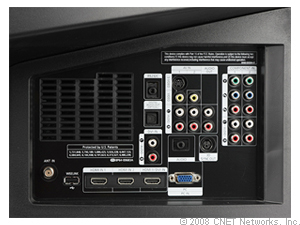 Plus, there are two component video inputs for any analog HD devices you have. For standard-definition analog video, there is a single S-Video input and two composite video inputs. A PC-style VGA input is also included, as well as a digital optical audio output, too. "This may be the best rear projection TV ever!" by WonderDude on April 29, 200, 5.0 stars. "Awesome TV : LOVE IT", by cadiman26 on July 22, 2008, 5.0 stars. "Jawdropping - Simply Amazing - It must be the mirrors", by gbcox on August 10, 2008. The HL61A750 is part of Samsung's Series 7 models, which feature this year's Cinema Pure Color Engine and use the Generation 2.3 LED light engine. The light source is rated for 60,000 hours while being Energy Star compliant. As expected, this set is rated to use a bit less energy, but what savings you'll see will surely depend on your viewing habits. Because of the long-lasting bulb, you won't have to replace the light source for the life of the TV. The downside is that should the bulb go bad, replacement can be a tad expensive. We found the Samsung HL61A750 to have a very good picture, with reasonably dark black levels for a screen of this size. It is typical for larger rear projection sets to have problems with convincing black levels, but the results were decent with this 61-inch model. Likewise, we found the colors to be quite vivid and reasonably lifelike during our extended viewing. This 61-inch Series 7 model is a full HD 1080p set, and thus accordingly features a native resolution of 1,920x1,080. It can accurately display every pixel from 1080i and 1080p sources, and up-converts 720p source material accordingly. Any set this size is going to have some issue with standard definition content, but the HL61A750 did a reasonable job of smoothing the image so that even older shows still look crisp and clear. With a set this size, however, the true HD content from Blu-ray and cable TV is what truly impresses. There are plenty of connectivity options to get content to the HL61A750. Samsung has provided apt connections for all your A/V needs, including a reasonably impressive three HDMI 1.3 inputs. While the x.v.Color support is still yet to be fully realized, it is a nice inclusion with this set, especially considering that you're likely going to want to keep it for a while. The only complaint about the A/V options with the Series 7 models--and actually with all of Samsung's DLP offerings for 2008--is that these inputs/outputs have been placed on the side. This means the set can be fully pushed back to the wall, but it does limit the placement of other components, or could mean you'll have to get longer cables. This set features three HDMI inputs, and we really would have expected to see four for a step-up model. But in addition to the HDMI, the HL61A750 further features twin component inputs, S-Video and PC (RGB) inputs at the back, as well as side composite and S-Video inputs. This set further features a USB input with WiseLink USB 2.0 for playback of photos and MP3 audio tracks. We also found the two 10-watt speakers to be a little lacking for a set this size. While these do support SRS TruSurround XT, the results don't really compare to a true home theater surround sound system, especially in larger rooms where the HL61A750 is likely to be most enjoyed. Fortunately given the price, you'll be able to spend the money on a good home theater system and enjoy a home cinema experience with a truly massive set. Width 54-2/5 in, Height 37-4/5 in, Depth, 14-2/5 in, Weight 70.1 lbs, PIP/POP yes, Screen size 61 in, Watts per channel 10 wpc, Comb filter yes, Display capability 1080p, Headphone jack no, Nbr. of speakers 2, Parental control yes, DVI/HDMI interface yes. The HL61A750 is A/V accessible from the side. The HL61A750 is 40% brighter than last year's 87 Series, using the Generation 2.4 LED light engine, putting its brightness on a par with lamp-based DLPs, but eliminating the need for a color wheel. This eliminates the so-called "Rainbow Effect" that is bothersome to some viewers of traditional color wheel-based DLP sets. Another advantage to LED illuminations is that there are of course never any lamp bulbs to replace here, which is environmentally conscious while also reducing the cost of ownership. Energy Star compliance results in power consumption--a mere 230 watts--approximately half that of a 60-inch plasma. The lifespan of the LEDs is longer than previous generations as well, rated at over 60,000 hours (roughly 27 years watching six hours of TV a day), so the light engine should last as long as the TV itself. With a 120-hertz refresh rate, the image being rendered 120 times each second, this is another Samsung DLP HDTV able to support demanding 3D video applications. The 3D processing displays the left-eye/right-eye images sequentially at 60 Hz each, and the LCD glasses in the optional 3-D DLP Starter Pack from Dynamic Digital Depth (DDD) work by shuttering each eye so that only the left or right can see each corresponding image. But don't confuse the 120 Hz processing on a DLP with the 120 Hz processing being touted in many forms on LCD televisions. LCD sets need this frame doubling in order to reduce motion smearing, which is not an issue on DLP sets. All 1080p DLP TVs run at 120hz in order to perform the 1920-by-1080 resolution reproduction: The DLP chip itself has a resolution of 960 by 1080, but it displays every odd/even horizontal pixel every other frame, thereby doubling the frame rate, so that our eyes see every last one of the 1920 columns. The extensively redesigned remote control is bigger, friendlier, and easier-to-use than that of its predecessors. Now the whole thing is backlit, although not as brightly, instead of a few select keys. As more consumers are using their cable/satellite remotes or an elaborate aftermarket universal remote these days, many TV remotes end up relegated to life inside a drawer or underneath a sofa cushion without being missed. But if you do that, you may miss the HDMI-CEC (High Definition Multimedia Interface Consumer Electronics Control) features of the remote. With Samsung's "Anynet+" interoperability feature (their proprietary extensions on HDMI-CEC), you can use the TV remote to operate up to three different Anynet+ enabled devices that are connected to the set via HDMI, while the device itself sits quietly tucked away out of sight in a cabinet or closet. The TV's IR sensor picks up the command for the other component and happily sends the control codes to it over the HDMI cable. This can be a simpler (and cheaper) solution than purchasing an RF-enabled universal remote if you want to keep your Blu-ray Disc and receiver in a closet, or anywhere outside the line of sight. This is just my personal opinion here but I found the previous layout of the on-screen menus more intuitive and simpler to navigate than on the new HL61A750, and I used both quite a lot. You can get used to the new one easily enough but it didn't feel quite as natural as the previous generation to me. The remote control has been completely redesigned for this generation. Many TV manufacturers are touting convergence - the blurring of the line between CE component, the computer and the Internet. Samsung's latest foray into this arena is visible in the set's on-board InfoLink RSS feed. This feature delivers the latest news from the Internet directly to the TV, as long as the set is connected to an Ethernet cable with internet access. Samsung's WiseLink feature returns in this model - a USB 2.0 port for connecting a thumb drive, for firmware updates as well as playing back the popular digital file formats MP3 for music and JPEG for photos. Wiselink has evolved to Wiselink Pro in this set, which adds support for MPEG-4 video playback. The HL61A750 offers a single-tuner Picture-in-Picture, so we can toggle between live TV and another video source, such as Blu-ray. The assemblage of input and output jacks has been rearranged somewhat but remains essentially the same, less one S-video input, no video output this time, and only one Antenna input. They are again located on the angled right side of the cabinet, out of sight yet less challenging to access than rear-panel jacks. With a thin bezel around the screen and only a foot-and-three-and-a-half-inches deep, the cabinet is remarkably small for such a large television. It does lack rigidity however, and the unavoidable stresses of delivery and installation revealed some unexpected bendiness, complete with creaks. After tweaking the settings of the HL61A750 with the use of the SpyderTV Pro calibration tool, I performed the standard battery of tests from both the HQV Silicon Optix Benchmark Blu-ray for HDTVs Version 1 (at 1080i over HDMI, to gauge the HL61A750's 1080i to 1080p deinterlacing) and the standard definition HQV DVD Version 1.4 NTSC (at 480i over component video, to measure the TV's ability to upconvert from standard-definition to the set's native high definition resolution). Of course at this tremendous size, all flaws are going to be magnified, but even so the slight amount of twitch on the flower, in the clouds or on the sailboat in the HD Noise Tests A and B on the Blu-ray tests disc could almost be dismissed as film grain. I could actually detect the processor locking on and banishing the noise on the flower, specifically. I noted rock-solid black-and-white horizontal lines in the four corner boxes of the Video Resolution Loss Test, proof-positive of full-resolution processing. None of the three bars in Diagonal Filtering: "Jaggies" Test - Pattern A had what I would call ideally "smooth edges." The worst offender was the topmost of the three, which took on a life of its own with a bizarre puckering of crooked artifacts on the sides. On "Jaggies" Test - Pattern B, issues with the performance of the diagonal filtering, while still evident, were less severe on the single rotating bar test, although there was far too much visible activity on the edges. Lots of connections, although not quite as many as on the previous generation. Continuing on with the 1080i test disc, while I could definitely delineate the fine horizontal lines in the Film Resolution Loss Test, all four of the corner boxes unfortunately strobed with unmistakable vertical lines left and right. In the Stadium Film Resolution Loss Test, what begins as a slight twitch on the upper deck stands became a full-blown moiré pattern about ten seconds in, particularly on the darker seats toward the right of the screen. So in the HD deinterlacing realm, the HL61A750 fights noise well but some of the more demanding details in actual image content were a strain. Moving on to the standard def test DVD, tiny black-and-white horizontal lines were clearly visible at Marker "1" of the Color Bar/Vertical Detail pattern, while the transition from dark to light blue was happily smooth and subtle suggesting excellent grey scale and color gradation. While minor, quivering processing could be seen along the edge of the long white bar of "Jaggies" Pattern 1. In general the performance was good, which is to say not distracting. "Jaggies" Pattern 2 proffered quite smooth edges on all three bars, although the head and foot of some, particularly the bottom bar, were doing a weird little shuffle. There's a slight bend in this same spot on the sample "Pass" frame so I guess this is to be forgiven. Acceptable, natural detail was evident in the texture of the background building and only modest jagged edges were noticeable on the flapping flag. Picture Detail was a tough one this time, with a definite, disappointing softness to the bridge scene in all of the key areas: the close, fine lines of the steps, the basic curves of the statue, the hard rectangles that make up the bridge, and what should have been the many individual blades of grass. There were no obvious scan lines or outline ringing, but the blurriness bothered my eyes. The nature imagery in the Noise Reduction section showed only a minor twitchiness, some faint mosquito noise on the tree in the final shot, although image detail was good overall. Motion Adaptive Noise Reduction was sharp enough, with no smearing in the motion and minimal sky noise in the roller coaster shots, even less over the boat/bridge shot. And it's always fun to spot that fraction of a second of the moiré pattern in the 3:2 Detection segment, then watch the TV in question make light work of it. In almost no time, the HL61A750 rendered a clean, stable image for most of the first pass of the Super Speedway clip and for all of every pass thereafter. This was a huge improvement over the HL-T5087S, which lacked 3:2 pulldown processing and so was unable to detect the underlying film cadence and correct for it. It's important to note that for the set to detect and correct for film cadence, FILM MODE must be set to ON in the Picture menu. Coffee cups were surprisingly twitchy at most of the funkier Film Cadences, and the newspaper in the shot often showed artifacting as well, although more common formats such as 3-2 24 fps film source material looked good. The Horizontal Text Crawl in Mixed 3:2 Film Mixed with Added Video Titles was beautifully clear, while Vertical began and ended well but broke into jittery lines during the middle portion. So it was a mixed bag performance-wise on the test discs, bullish on noise and 3:2 pull-down but soft on detail. In terms of the set's 3D features, the implementation is the same as seen in the earlier model, so for details on how that works, see my review of the HL-T5087S. But beyond this, the set's perormance diverges from its predecessor in several significant ways. No surprise, the additional inches of the HL61A750 vs. the 50-inch model lent additional cinematic impact to all movie watching. Blacks were solid, but I was more interested in watching Samsung's latest spin on their CinemaPure Color Engine in action, driven as it is by the Generation 2.4 LEDs, promising high contrast, defined edges and sharp details, in addition to a wider color gamut. Indeed, colors were especially impressive. I began with 10,000 BC, whose hues so amazed me in my recent Blu-ray disc review, and here too revealed an almost jaw-dropping vibrancy. I switched over to the synthetic shades of Ratatouille, and again I was hypnotized by the broad palette. At 61 inches diagonally, this could stretch wall to wall in some NYC apartments. I can't say that I was as pleased with the level of detail being rendered. In general I found the picture a touch softer than expected, more noticeable as I switched to the Blu-ray of Blade Runner: The Final Cut. The film image appeared ever so slightly less detailed when toggling down to 1080i from 1080p output on my PlayStation 3, as if the deinterlacing was an appreciable burden on the video processing. It's simple math here: The higher quality the video signal in, the better the results you can expect. SRS TruSurround XT processing is again provided here, with a variety of preset modes. I could hear a slight difference between them, and this solution is a fine quick-fix for any audio/video sources not run through your receiver. To that end, the digital optical audio out can pass the audio feed of the set's built-in ATSC/QAM tuner out to a decoder or receiver for a true home theater experience. But if you are using your TV speakers exclusively, you could definitely do worse than the 20 watts total stereo sound emanating from within the HL61A750. While the size and value of the HL61A750 are surely major selling points, we must not overlook some of the less obvious refinements to this series of LED DLPs, namely the enhanced level of tweakability. A new submenu allows us to manipulate many settings within Movie mode, including Gamma, Black Adjust (like Gamma, but for the darkest portion of the signal), Dynamic Contrast, White Balance, Color Gamut, and My Color Control, which adjusts flesh tones, grass colors and whites specifically. There's even a xvYCC setting which, when switched on, applies high-end xvYCC decoding to the signal and maps the image to the HL61A750's wider color space, as dictated by the program material. So, with more than 60,000 hours ahead of us, we have ample chance to explore and customize the picture to our liking. Weight with Packaging: 94.2 lbs. Designed to fit Samsung: HL-T7288 72-inch 1080p DLP Rear Projection HDTV. This TV stand features stylish contemporary design and is easy to assemble with household tools. Click Here OneCall's Everyday Low Price Is Guaranteed! NOW: $285.97 Delivered.